Summary / KeywordsIn March 2010, Open Space hosted the piano series Between the Notes. Following special performances by Tzenka Dianova and Lubomyr Melnyk, we invited Seattle pianist and composer Gust Burns to spend a week in residence working with an old upright piano donated by Michelle Purvis. 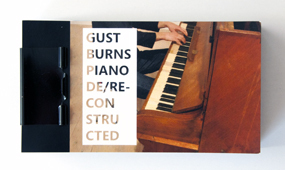 Burns’ haptic deconstruction process, Piano De/Re-Constructed, is the consequence of his profound engagement with the piano. See this process documented in a 144 page flip book image series from start to finish.